Google Analytics tells me people are finding their way here by searching for quilled snowflakes and Christmas paper crafts, so at least some of you are already thinking about the holidays. I agree it's nice to get a jump on making things, or at least to have an arsenal of ideas bookmarked for later. I've gathered a few things that I plan to do... oh, probably around December 20th or so, knowing me. It just wouldn't be Christmas in my house without a frenzied craft project cluttering the kitchen table! Lastly, I bet most everyone admires a handmade garland at the holidays, whether it's strung popcorn and cranberries or something more elaborate. 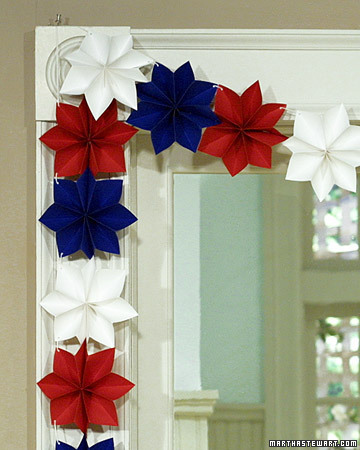 This paper poinsettia garland tutorial from Martha Stewart is reminiscent of poinsettias. I think it would be beautiful made up in shades of gold, or perhaps greens and reds that aren't necessarily the traditional kelly and clear red. Let me be the first to wish you Happy Holidays 2011... ready, set, go! p.s. I promise there will be a quilled snowflake pattern coming in the not too distant future. Meanwhile, here are links to previous patterns: snowflake 1 and snowflake 2.
you've hit the nail on the head Ann. I don't have any new posts on my blog because I an knee deep in quilling pieces for my nativities. I have to do it now or it will be too crazy in the fall...and besides our weather in Vancouver has been like November any way so if you put on some Christmas music it gets you in the mood. Lovely gift bag tutorial. I love the festive paper garland.Thanks for the link Ann. Thanks for the link Ann. Lovely to find your site. Paper quilling is on my list of things to do! ..lovely project. I tried to watch the video link but though I can see various videos listed, including that one, clicking on it doesn't bring anything up?? Any tricks? Carole, if you mean the garland video, at first there's a black screen, but then it does start after a short ad. Good luck! Oh my, so darn cute!! !